Crossing points of longitudinal and latitudinal lines are very sensitive points in Vastu Purush Mandal .They are called as 'Marmasthana ,'Mahamermsthana and Upmermsthana. Mermstahana: - There are sixty four intersection point of two Nadis (Shiras) called Mermasthana. 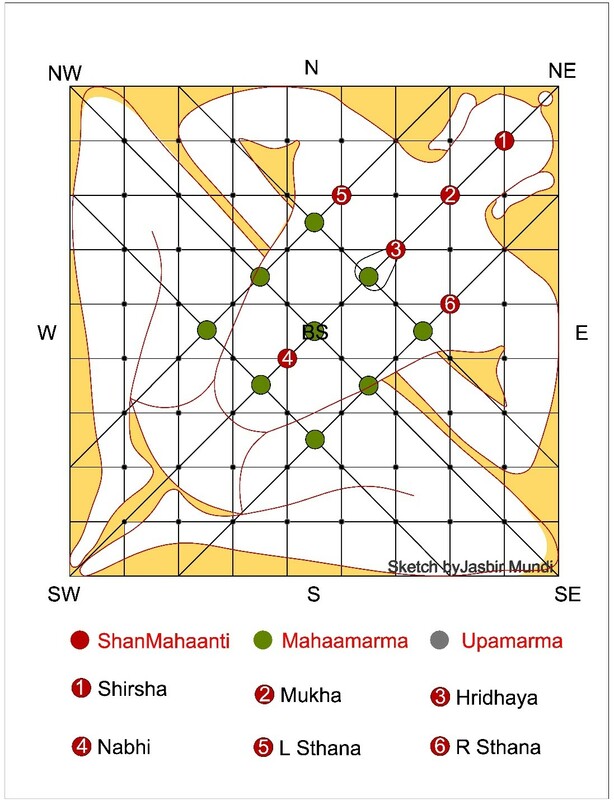 Mahamermsthana:-There are nine places where 'KonSutra's (3+3=6) intercept each other diagonally called 'MahaMarmasthana' These intersection points of Raju (vansh) are very sensitive nadis . The remaining crossing points are called as 'UpaMarma'. Shanmanti :- There are six places in Vastu Purush Mandal, known as Shanmahanti. They are as follows : 1) Shir/ Head 2)Mukha/ Mouth 3)Heart 4)Nabhi/ Navel 5)Vamsthana /Left Mammal Gland (left side 4-2) and 6)Dakshin sthana/ Right Mammal Gland (right 4-2) . They are very sensitive and relate to health problems. The above mentioned are very sensitive points in Vastupurush mandala and no column or beam should be constructed over it , as it can affects the 'MarmaSthaan' and cause the owner to suffer health problems at that particular limb of his own body .